Craft dies featuring Borders. Work with any manual die cutting machine. Use with a magnetic base plate and die cutting plate. A wonderfully festive border that repeats with ease across your card or scrapbook page. Design area measures approximately 4-7/8" X 3/4". Made from premium stainless steel. Designs copyright Lynell Harlow and Dreamweaver Stencils. CottageCutz are thin metal dies. They are easy-to-use and add great detail to any craft project. This die is approximately 1.5" x 7" and is compatible with the following machines: QuicKutz Revolution, Sizzix / Ellison Big Shot, BigKick, CuttleBug, SpellBinders Wizard, SpellBinders Grand Calibur and Accucut Zip'eMate. 100% guarantee that this die cuts on the above machines. Adapters/shim may be required on some machines. Craft die featuring a farm border, including a barn and windmill. Penny Black craft die featuring Cut Out Borders. The Stitched Basic Edges 2 Die-namics (like our wildly popular Stitched Basic Edges Die-namics) includes 4 new cut line only edge designs that leave a delicate stitch line on both sides of the cut. Create shaped card edges or piece die cuts together for multi-colored, stitched panels. This 4 piece set includes: Cut lines measuring 5 3/4" in length and 7/8", 3/4", 3/4", 3/16" in depth. MFT Die-namics dies are our very own EXCLUSIVE, American made line of steel dies. Die-namics dies work with most tabletop die cutting machines such as the Big Shot & Cuttlebug. Our Dotted Borders Elle-ments exclusive steel dies will dress up any project with cute pierced dot borders and more! Border dies measure on average: 5 7/8" x 1/4", Circle die diameter: 5/8". Our Exclusive Steel Dies are proudly made in the USA. Tessler Crafts. Ellentina Cutting Dies - Grass. Compatible with most tabletop machines. Approximate Size: 5" x 1.50". Cutting dies can be used in paper crafting, scrapbooking and home decoration. Use colored glues, inks, paints and glitter to add embellishments to the cutout die shapes. Craft die featuring a Farm Border. CottageCutz are thin metal dies. They are easy-to-use and add great detail to any craft project. Made in the USA. 100% lead free. Approximate Image Size: 1. Numerical Die: 6.0" x 0.25", 2. Scalloped Die: 6.25" x 0.13", 3. Ornamental Die: 6.25" x 0.25", 4. Paper Edge Die: 6.25" x 0.25", 5. Wrought Iron Die: 6.25" x 0.75", 6. Film Strip Die: 6.25" x 0.25", 7. Swirling Die: 6.25" x 0.75". This is an exclusive Heartfelt Creations Die manufactured by Spellbinders and will work with most manual die cutting systems. The Decorative Blossom Corner Die has more intricate details, so if you have a "loose" machine, you will have to cut a couple times and rotate it 90 degrees with each pass. *This die does not cut out in the straight or corner edges. This enables you to create a photo corner or a doily. Approximate Die Template Sizes: 1. Large Corner: 4.25" x 4.25", 2. Small Corner: 3.75" x 3.75". Delicate borders featuring gentle swirls, elegant leaves, and intricate designs will add a touch of whimsy to any of your paper creations! Either layered or used as single die cuts, these borders are an excellent way of adding interest to your cards, heirloom albums and scrapbook layouts! Create exquisite decorative pockets, elegant edging for handmade cards or eye catching cut outs for layering on mixed media pieces! These decorative die cuts are a wonderful enhancement collection to pair with and embellish the Interactive 3D Flip Fold Album Collection as well as the Foldout Card Collection, and are sure to be investment pieces used for many years to come! Approximate Image Sizes: 1. Delicate Scrollwork Die 1: 7.0" x .5", 2. Delicate Scrollwork Die 2: 7.0" x .5", 3. Delicate Foliage Die 1: 7.0" x .25", 4. Delicate Foliage Die 2: 7.0" x .5", 5. Delicate Eyelet Die: 7.0" x .25", 6. Delicate Swirls Die: 7.0" x .5". Approximate Image Sizes: 1. Elegant Border Die 1: 7.25" x 1.0", 2. Elegant Border Die 2: 7.25" x 1.0", 3. Large Floral and Leaf Flourish Die: 2.25" x 4.75", 4. Happy Sentiment Die: 2.0" x .5", 5. Birthday Sentiment Die: 3.0" x .5", 6. Thank Sentiment Die: 2.0" x .5", 7. You Sentiment Die: 1.25" x .5". 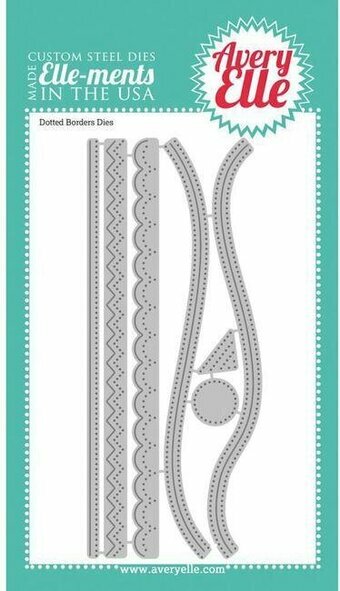 Pretty, eyelet lace like die cuts are a simple way to add an elegant touch to any paper craft creation! Choose from a larger scrolling flower pattern perfect to use for die cutting decorative card fronts, or a romantic eyelet heart infused border ideal to use as a dainty embellishment on scrapbook layouts or mixed media projects! These decorative and detailed dies are extremely versatile for any occasion and will make a magnificent addition to your existing border die collection! These dies are part of the Heartfelt Love Collection. Approximate Image Sizes: 1. Large Floral Die: 5.75" x 3.0", 2. Large Floral Outline Die: 6.0" x 0.15", 3. Eyelet Heart Infused Border Die: 7.0" x 1.0". These three slim dies will not cut out shapes in your paper. Instead, they cut cross and stripe patterns that can be used to create nice borders or backgrounds. Use them alone or together to give your projects a unique look. Includes 3 dies. Size: 0.2 x 6 inches. Joy! Crafts Cut-Deboss Die - Fire Edger. A great border to compliment the fire extinguisher and fire hydrant with this release. Perfect for those firefighting cards and layouts. 1 die. Size: 4.72" x 1.97". Joy! Crafts Die - Flower Border. This attractive floral border will add a lovely decorative flair to your projects. Size: 5.5" x 1". These dies create excellent patterned borders for your projects. Enjoy a variety of different stitch patterns. Includes 3 dies. Size: 6 x 0.25 inches. Joy! Crafts Die - Flash Border. This flash border is a versatile die that can be used as a border for almost any project. Size: 1.12 x 5.52 inches.